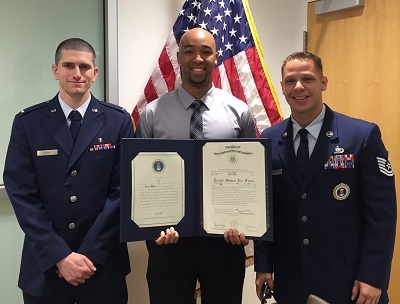 Palo Alto University (PAU) doctoral student Deonte Williams is flying high after learning he was awarded the highly competitive Health Professions Scholarship from the United States Air Force in addition to being commissioned as an Air Force Second Lieutenant on May 9. Williams, who begins the third year of PAU’s doctoral program in clinical psychology in the fall, was one of only a handful of students selected for the award from hundreds of applicants. The scholarship provides Williams with full tuition and living expenses while at PAU and places him on track to apply for a military-based internship following his fourth year of graduate coursework. Upon completion of his internship year, he will be serving in the Air Force as a full-time clinical psychologist in an officer's capacity. “This is a tremendous opportunity for Williams,” said PAU’s Alvin Thomas, Ph.D., research advisor and mentor. “We are incredibly proud of his accomplishment." Williams, originally from Silver Spring, Maryland, received his bachelor’s degree from Loyola University, also in Maryland. He will go through basic training during the summer of 2019 and begin a two-year active duty service tour after his internship year.